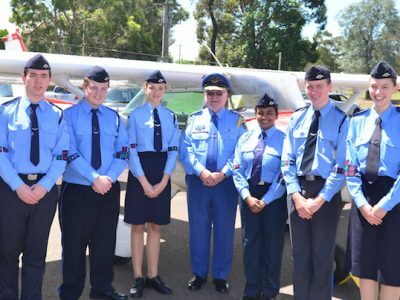 Over the recent weekend at the NSW Goys’ Group Air Activities Centre at Camden, NSW the annual selection of the League’s Cadet of the Year (COY) took place. Also taking place at the Air Activities Centre, over the two days, was a meeting of the Cadet of the Year Advisory Group (COYAG) – comprising most of the COY 2015/2016 candidates and including the winners Cpl Catherine Nguyen, South Australia Wing and Sqn Sgt Brandon Beckers, Queensland Group. In addition on the Saturday the Council of the Australian Air League met. Sqn Capt Kyle Laing – Assistant to the Federal Training Commissioner and himself a COY winner in 2006 when he was a Sergeant, hosted and mentored the candidates throughout the weekend collecting them from Mascot Airport on Saturday morning for a visit to the sites of Sydney including the Maritime Museum as well as enjoying a ferry trip on Sydney Harbour and visiting the Opera House and other sites. After the COY candidates returned to the Narellan Motor Inn, the ‘cream’ of the Australian Air League’s youth membership, including the members of COYAG, travelled to the Camden Civic Centre’s Ferguson Gallery where they were joined by the League’s Public Officer, the League’s Secretary, Federal Staff and the NSW and Qld Group Executive Commissioners for networking and dinner. After dinner, and as part of the Cadet of the Year evaluation process, all candidates are required to make a 15-minute presentation to enhance their opportunity to be selected as the League’s Cadet of the Year. This year the topic of their presentation was ““My Squadron: what makes it successful and what it could do better”. All of the Senior Officers present, as well as the 2015/2016 Cadets of the Year, marked these presentations taking into account delivery, confidence and relevance. At the conclusion of the presentations was a return to the accommodation and a good night’s sleep as breakfast was being served at 0645 on Sunday. The Sunday activities commenced at 0800 with a return to the Camden Airport and, for the COY candidates, included flying conducted in the League’s owned aircraft VH-UNL operated by the NSW Boys’ Group Air Activities pilot, Keon Little. Unlike previous years, the day provided excellent flying conditions. Around the flying schedule were conducted uniform inspections, knowledge assessments and individual panel interviews, the results from which are entered in to a weighted analysis matrix to ascertain the successful candidates. Any of the nominated candidates would be able to represent our Organisation with pride and should be very proud of their performance. Their families, Squadrons and Groups who assisted them with their preparation should also be very proud of their involvement and performance. All were, and are, winners and who now form part of the Cadet of the Year Advisory Group. On behalf of the Australian Air League Inc., may I extend hearty congratulations to the winners and commiserations to their colleagues who were not successful. To miss out on selection in such company is no disgrace as those selected, to represent their Groups, were truly outstanding in all aspects and, as previously stated, their parents, officers and colleagues can be very proud of them. The League’s thanks go to the NSW Boys’ Group for making the venue available, the NSW Boys’ Group Air Activities staff that assisted throughout the weekend whilst managing ongoing student flying training. All who attended the weekend should be proud of their individual contribution in making the weekend a success, and for providing our candidates with a weekend that they will not forget quickly.